This site is dedicated to the history and heritage of Sindh, especially, the Talpur Period and role of Talpur Mirs in Sindh's society. The Royal Talpurs of Sindh are those Balochs of Arabian descent who ruled Sindh from late eighteenth century to about mid nineteenth century. Although their rule was relatively short, spanned over about little less than a quarter of a century, they have remained influential throughout history since sixteenth century, when one of the Hoth Baloch's descendant adopted the surname Talpur, to the present times. 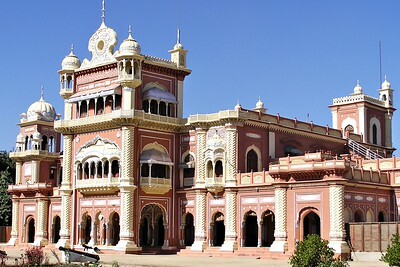 From Balochistan, where they started ruling since Mir Jalal Khan who established a state spread over Siestan and parts of Balochistan, they moved to Dera Ghazi Khan and then migrated to Sindh, where not only they ruled, they merged with the Sindhi culture and became true patriotic Sindhi warriors and freedom fighters. During the British occupation of Sindh, although Talpurs of Khairpur Mirs supported westerners, the other Talpurs continued their covert struggle for the independance of Sindh. Talpurs were tolerant and peace loving rulers and stories of their philanthropy and charity are still told widely by the elders of the Sindh. The religious tolerance they shown was exemplary. Hindus, Muslims, Sikh and other religious communities lived happily and peacefully in Sindh during Talpur Mirs times. Although they were very religious Muslims, they were not intolerant. They not merely built mosques but also Hindu Temple. One such old Hindu temple, reconstructed and renovated by Talpur Mirs still exists in original condition in the town named Halani, in Sindh. Excellent building constructed in early 1930s by Mir Ghulam Haider Khan Talpur (father of Mir Taj Muhammad Khan). This bungalow and saw it in a dilapidated condition. It urgently needs restoration. One can still make it a wonderful place. Lets hope someone will bring it to life again. Talpur (Sindhi: ٽالپور) (Urdu: تالپور) is a Sindhi Baloch tribe and is settled in Sindh and Punjab provinces of Pakistan. They are descendants of Mir Tala Khan they arrived in Sindh during the invasion of Nadir Shah, the Talpur's settled in northern Sindh, spoke the Sindhi language very soon their descendants and allies formed a confederacy against the Kalhora dynasty. Later, however, they enjoyed good relations with the Kalhoras and were invited by them to help organize unruly Baloch tribes living in Sindh. Although most of the Talpur's are basically Shia, they were the founders of Sindhi unity. Talpur dynasty ruled Sindh, in present-day Pakistan, from 1783 to 1843 and were over thrown by the British East India Company led by General Charles James Napier. Mir Thara Khan ruled at Mirpur Khas and Mir Sohrab ruled at Khairpur. The critics consider this as contentious issue and malign the Talpurs. They fail to see that this was better than putting the pretenders to the sword and starting costly internecine wars. Abdul Majeed Jokhia, an eminent historian of that period says that Sindh was divided into seven districts, three were under Mir Fateh Ali and his brothers, (sons of Mir Sobdar), two were under Mir Sohrab, one under Mir Thara of Mirpur and one under Mir Mahmood, (their uncle) and sons of Mir Abdullah. Talpurs, who pardoned even their most inveterate enemies couldn't be expected to wield swords against their brethren. In cases where they had to, they were ruled by reason and showed great restraint. It was Mir Fateh Ali who made Hyderabad the seat of rule.